Of one thing we are certain: there is almost nothing that is good to be said about the Sendai earthquake. It will not be a catalyst for long-term economic revival, it will not improve the chronically reform-averse nature of Japanese politics, and it will not change the Japanese ‘mindset’. What the disaster does do is throw into sharper relief some positive changes that were already visible before March 11. For the last two decades Japan has been undergoing a long, slow series of adjustments in the way it does business and conducts public life, and these have mostly been changes for the better. Just as in the credit-fuelled boom years of the late 1980s Japan appeared stronger than it actually was, today Japan is nothing like as weak as it may seem. This strength will be apparent in the speed and strength of Japan’s recovery from the effects of the Sendai quake. True, there are several important imponderables. 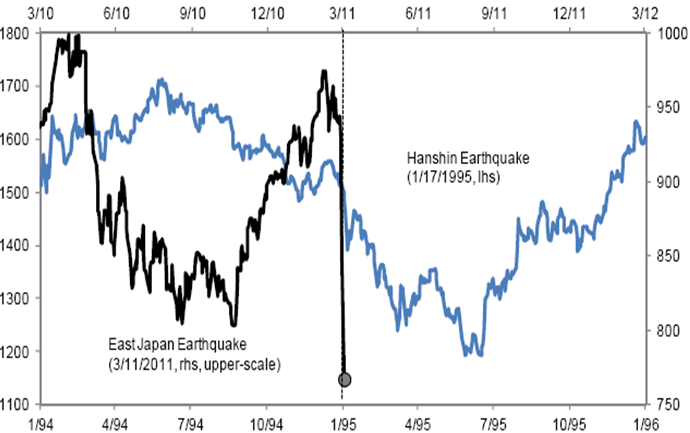 The biggest of all is the question of whether a huge earthquake that damages Tokyo is now more or less likely. While informed opinions vary, it is agreed that the geological plate beneath the Kanto Plain upon which Tokyo sits is extremely complex, such that forecasts cannot be made with much conviction. Clearly, a large Tokyo quake would change everything. The next question concerns the impact on public finances in this most indebted of all developed economies. As the extent of damage has become clearer estimates of costs have gone up. 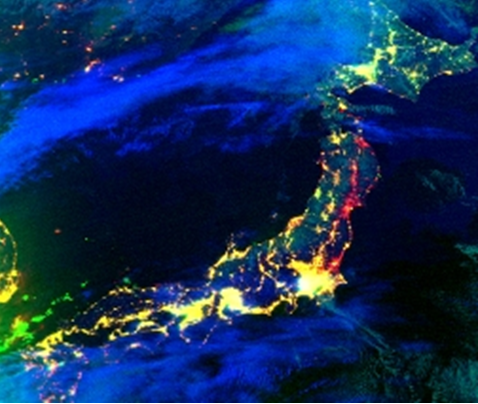 Initial assessments were that they might be double the $100bn that the 1995 Kobe earthquake is believed to have cost. Today Japanese sources are suggesting a figure of $300 billion, or around 5.5% of unadjusted dollar GDP. This is a significant sum for a country where gross public debt is now well over 200% of GDP. However, as many have already pointed out Japanese net debt (ie, gross debt minus ‘receivables’) is a lot lower. Depending on who is doing the calculation, net debt is anywhere between 90% and 140% of GDP (the variation comes about because of different evaluations of some assets, such as public sector holdings of JGBs). Before the quake the OECD forecast was that the net position would be 120% of GDP at the end of 2011. If we go with that figure and if the government bore half the total estimated cost of the Sendai quake, it would add just under three additional percentage points to the net debt ratio. This is unwelcome but clearly it is also sustainable both in terms of financial resources to hand and in terms of confidence in public finances. Japanese sovereign debt is largely domestically financed, and while the personal savings ratio has been falling, the corporate savings ratio has risen. There is also $1tn in foreign reserves. Japan has no need to fear the ratings agencies. As for the wider economy, the consensus is that a disaster of this magnitude will lead to an initial contraction in GDP due to disruption effects, followed by a resurgence due to reconstruction. This consensus is probably right. But we also need to remember that as a result of the tsunami the disruption cost to growth and profits will be considerably higher than in the Kobe quake, and may well not be confined to 1H11 (which is what most commentators assume). But the nuclear dimension of this disaster has added to the uncertainties. We are not qualified to forecast the fate of the Fukushima reactor, but we can say for certain that Japan’s nuclear power industry has an absolutely dreadful record of incompetence and cover-up, and it is proving no better run today than before. And the lack of transparency and accountability in the nuclear business are exactly the factors that also lie at the root of the chronically poor returns the Japanese private sector as a whole has offered to owners. Yet it is clear that patience with this manner of doing things is running low. This is visible in the aggressive way the government has tackled the hapless TEPCO nuclear management, an approach which is of a piece with the government’s aggressive monetary policy response to the disaster. Determined to avoid a repeat of the disorganised and tardy response to Kobe, this time it looks like the government means business. The fact is, many Japanese are heartily fed up with the old ways, in public life and in business. And perhaps an emboldened government will get serious about long-term debt reduction too. There are various options. Most of them would be unpopular, but these are desperate times. Japan would certainly not welcome a one-off wealth tax, for example, but it could afford it. Perhaps – just perhaps – the time for such measures is close. Nothing in this document constitutes or should be treated as investment advice or an offer to buy or sell any security or other investment. TT is authorised and regulated in the United Kingdom by the Financial Conduct Authority (FCA).